Earlier this month, Marlins pitcher Jose Ureña spiced up the team’s divisional rivalry with the Braves by plunking the white-hot rookie Ronald Acuña Jr., who at the time had hit three consecutive lead-off dingers. (The HBP didn’t technically snap Acuña’s streak, although he didn’t hit a lead-off HR the next day.) The benches cleared, Ureña ended up with a six-game suspension, and Marlins manager Don Mattingly made sure the pitcher wouldn’t be on the mound for this four-game series against Atlanta. The rest of the players still brought some tension to Thursday’s game. In the third inning of last night’s 5-0 Braves win, Acuña crushed a 432-foot homer to left field. It was clearly cathartic for him, and would’ve been a fine conclusion to the feud. But then Marlins reliever Javy Guerra had to go and stamp Acuña with a pitch in the sixth. The 20-year-old spiked his helmet and paced around home plate; the benches did not clear. It would be foolish to hit a batter on an 0-2 count with two outs, so Guerra has some plausible deniability. The pitch actually might’ve gotten away from him. 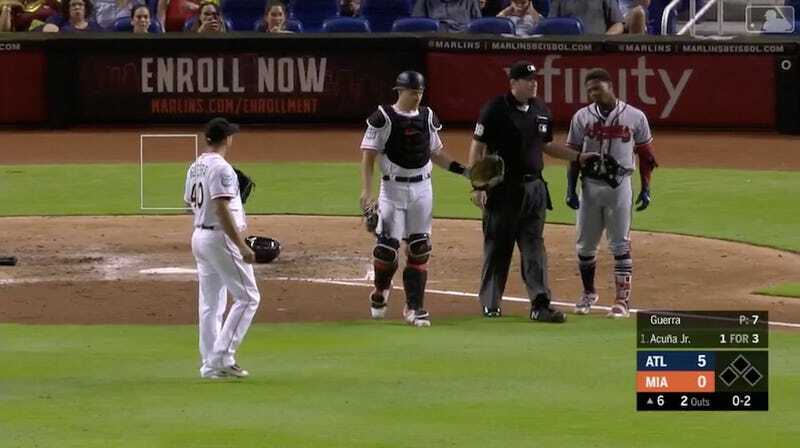 That did not matter to the Braves or starting pitcher Sean Newcomb, who tagged Marlins third baseman Brian Anderson in retaliation. The benches did not clear, again, and both teams were warned. As it sits, these two teams are “even,” if that’s possible with no Ureña. They have three games against each other left in the series and this season. There are still a lot of opportunities to get in the final word.